Mangaluru, Oct 10, 2016: The MCC, Mangaluru City Corporation, is far behind in the collection of water bills, they plan to conduct bill collection camps at 40 areas in the city for over a month from October 13. The camps will be held till November 19 in the first phase. Officials will issue bills to those who have not received it and will also collect the bills from defaulters on the spot. According to Mohammed Nazir, commissioner of the MCC, the civic body was able to collect only 18 per cent of the Rs. 45 crore annual revenue demand from water bills till this September-end. “We should have been collected 45 per cent to 50 per cent of the demand till September,” he said. The commissioner said that the officials have been given a target of collecting 40 per cent of the total demand by October-end. “They should collect 22 per cent of the total demand in October alone,” he said. MCC’s Nazir said that the corporation collected 80 per cent of the total revenue demand from water bills in 2015-16. “We should be able to achieve 90 per cent collection in 2016-17,” he said. In the next week the camps will be conducted at Derebail Konchady Yuvak Mandala (Derebail East ward No 23) on October 13 and at Kapikkad Yuvaka Mandala (Derebail South ward No 24) and at Vaidyanatha Yuvaka Mandala (Derbail West ward no 25) on October 14. 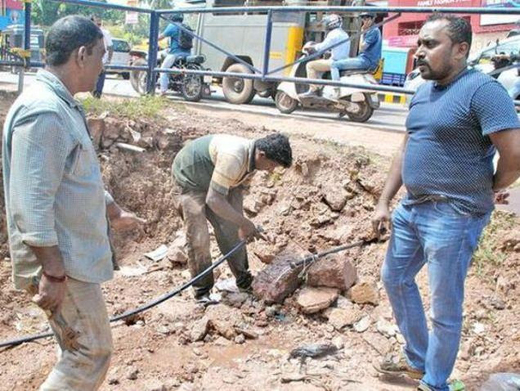 Acting against unauthorised water supply connection, officials have cut water supply to a canteen at PVS Circle. An engineering section official said that the canteen did not have trade licence. The trade licence had been obtained for the trade ‘cloth exhibition and sale’ of M/S New Bombay Fashion. The official said that the corporation filed a complaint against this at Mangaluru East Police Station against Nakwa Apzal who had obtained licence for ‘cloth exhibition and sale’ and not for a canteen.